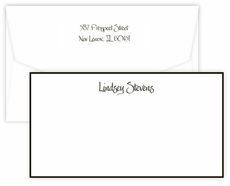 Classic detailing on this set of flat note cards on triple thick white or ivory stock. Your choice of border and personalization colors. Personalization is printed in raised ink. Positioning only as shown. Size is 6.2" x 4.5". Blank envelopes included. Printed return address and optional envelope linings available. Please note, raised print ink colors and matte border colors may not match exactly, they coordinate or blend.